In Central and Eastern Europe, as in most economies, the transport equipment sector plays a major role in manufacturing, due to its size and foreign trade volume as well as its links with the rest of the economy. It is considered a medium-high technology industry and belongs to the most globalized segments of manufacturing world-wide. In the Central and Eastern European countries (CEECs), the transport equipment sector is one of the fastest growing sectors, characterized by extraordinary production and export growth and supported by a massive inflow of foreign direct investment. Part One of the study investigates the development and prospects of the transport equipment sector in the following countries: - Bulgaria - Czech Republic - Hungary - Poland - Romania - Slovakia - Slovenia In size, the transport equipment sector emerged as a major player in total manufacturing of the more advanced CEECs today and contributes between 9% and 12% of output, with the Czech Republic and Hungary having the largest shares of the CEECs analysed. Only in Romania and Bulgaria, is the sector of minor importance. When compared to countries of Western Europe, the CEECs are in the middle of the range, having smaller transport equipment shares than the more advanced EU countries but larger ones than the less advanced countries. 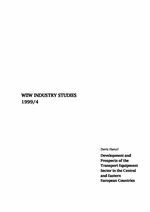 In the first phase of transition, which lasted from 1989 to around 1992, the output of the transport equipment sector declined along with the larger economy and was even more affected than total manufacturing. From 1993 on, the performance of the sector improved and it became one of the most successful segments of manufacturing, due to growing domestic demand and the inflow of foreign investment in particular. The Hungarian and Polish transport equipment sectors emerged as the regional growth leaders, while the Slovenian one continued to decline. As an employer, the transport equipment sector is of middle importance and employment shares range between 3% in Bulgaria and 9% in Romania today. Output shares were decisively larger than employment shares in all countries in 1997, except in Bulgaria and Romania, where production is still more labour-intensive. As is typical for all CEECs and all sectors of manufacturing, wages, productivity and unit labour costs in the transport equipment sector were and are generally much lower than in West European countries, for which we used Austria as a point of reference. Only in Hungary, did the sector's productivity surpass the Austrian level in 1997. From 1993 to 1997, wages and productivity rose in all countries. As the productivity increase was larger than the wage increase, unit labour costs declined in most countries but increased in the Czech Republic and Slovenia. In general however, unit labour costs remain at a much lower level than in Austria. Ranges for CEECs' unit labour costs in the transport equipment sector as a percentage of the Austrian level: Bulgaria: 23% - 51% Czech Republic: 22% - 33% Hungary: 12% - 21% Romania: 17% - 57% Slovakia: 17% - 27% Slovenia: 38% - 45% Poland 29% - 40% (The lower range is calculated at purchasing power parities (PPP) for GDP, the upper range at PPP for fixed capital formation; figures are from 1997, with the exception of the Austrian level which is for 1996) In CEECs' manufacturing exports to the EU, the transport equipment sector holds a significant trade position in the more advanced CEECs, with shares ranging between 11% in Poland, 20% in Slovenia and Slovakia and 22% in Hungary. The sector is exceptionally export-oriented, shows a small revealed comparative advantage compared to total manufacturing and concentrates on exports of automotive products. In Romania and Bulgaria, on the other hand, the transport equipment sector has only a very small export share in total manufacturing. Other transport equipment products form a large part of their exports, leading to more unstable export structures over.